Ready to have some fun clearing clutter? We know, we know… “FUN – REALLY?” Yes, fun! With a simple plan, a support group of people honoring each other, fabulous resources and inspiration along the way; it can be fun to clear out the stuff! You’ll get all of this with our 30 Day Clutter Clear Out Event. Simple Plan: The invitation is to simply commit to releasing one thing each day for 30 days. It can be anything – a broken toy, old dress, extra gadget, or old pile of paper. We will give you a simple guide to follow or you can choose each day. Strong Support Group: Join our Facebook Group to connect with the crew and see other’s postings about their journey. Fabulous Resources: Jump on our website page clearsimple.com/clutterclearout/ for gifts and experts to help make it simple. Inspiration: Weekly blogs, weekly Q&A and daily postings on Facebook will keep you moving and excited. Marla will also be sharing her journey throughout the month on Facebook Live giving you her best guidance. 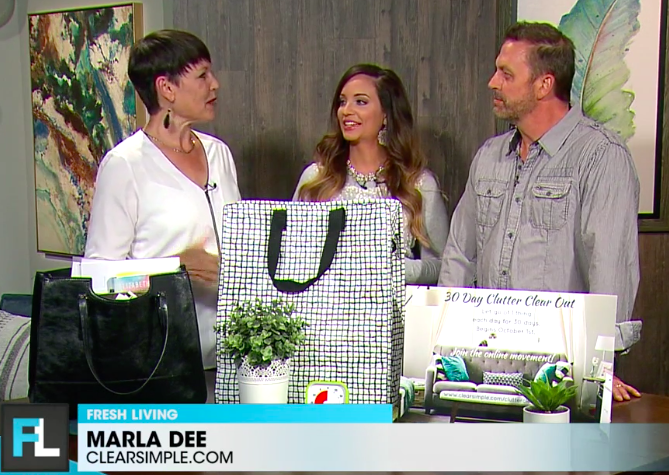 See Marla on TV How to Clear the Clutter for some jump start encouragement! We can’t wait to hear all your stories, support you and celebrate together! Marla, Kate & Team. We all know that our world offers a plethora of ways in which information floods into our awareness. Social media feeds are chock-full of posts, events and offerings. Email inboxes are inundated with subscriptions and solicitations (some signed up for by choice, many by spam). Brains and bodies are overwhelmed with energy that has a “Do this/you need this now!” flavor. Yuck! A group of beautiful souls are giving us a soothing new way. Joshua Becker of Becoming Minimalist, Brian Gardner of No Sidebar, Tsh Oxenreider of The Art of Simple, and Rebecca Cooper of Simple as That have combined their brilliance and expertise in simplifying life and created the digital publication Simplify Magazine. This mindful offering is solely supported by its readers, which means no icky ads or filler content, just straight forward, valuable wisdom and knowledge. We have been inspired by the powerful sharing in this online magazine. We hope you find comfort, ease, relief and hope. You can get the Simplify Magazine now and also check out their Facebook Page. We hope you embrace a simpler life and way of being in this world. We could all use a little big dose of slow and simple. Recently, I was sitting outside my son’s basketball practice reading and enjoying a new book. I overheard two parents reconnecting after being away for the summer. “How was your summer?” The woman asked politely. “It was great, but went by so fast! How was yours?” The man inquired. “Oh my gosh, so fast. I think it was the fastest summer ever and I was not ready for school to start.” She replied. I sighed deeply in empathy for I have also experienced just how fast life goes by. On the other hand I also felt grateful for Our Simple Summer that rolled by at a sweet pace; something I know was very intentional on my part. As I lamented over the “too fast” culture we live in, I continued to notice scenarios before me as parents zipped in and out of the parking lot, some dropping kids off and some picking kids up. One mom talked aggressively on her phone as her son climbed in the car and they drove away. Been there. A father was urging his son to hurry up and tie his shoes to get into practice. Been there. Another woman pulled into a spot, tapped her fingers impatiently while watching the school door. After about 15 seconds she jumped out and ran into the school to retrieve her son. Been there too. After many layers of simplifying our stuff, our time and our lives, my family’s approach looks very different than what I witnessed. We leave the house with more than enough time to get there. Our phones are put away so that we can be present with each other to talk, sing and laugh all the way. We arrive early giving us a bit more time to connect. As my son hops joyfully out of the car and saunters into the gym, I push the driver’s seat back, kick my feet out the window and dive into a book. This particular day I was reading a fantastic book called In Praise of Slowness: Challenging the Cult of Speed and was on chapter 8, Work: The Benefits of Working Less Hard. Over the last 6 months my soul has been begging me to bring my work life into alignment with our minimalist energy. The combination of this book, a couple of months of summer sweetness and experiencing the fast-paced madness of my fellow humans, has created a great urgency in me to make this happen right away. Barely making it through the day over-stressed, overly disconnected, under-nourished and under-inspired is certainly NOT the kind of life I want to live. How about you? Nothing calls me back to the most joyous times of being a child like summertime. Vivid memories of waking up without alarm clocks, spending days in the pool with friends, and traveling through the mountain states are always front and center come May. Since I first became a mom, my desire has been to have lots of summer adventures with my son and let work simmer on the back burner. This, of course, is easier said than done. When our minimalist journey began over 4 years ago, I had no idea just how powerfully it would support my deep desire of keeping our summers about play and connection. During those 2 years, and 25 layers, of releasing of stuff (we moved through lots of emotion too), I had no idea how this would set us free to really experience life! This summer was one of the greatest testimonies of how owning less and doing less gives us the opportunity to LIVE more. We spent four of the last five weekends in a row out of town, with the fifth weekend fully engaged in a 40th birthday celebration and a wedding. We were essentially not home for FIVE weekends in a row. We spent 5 days in Idaho to experience the totality of the solar eclipse. My son even missed the first 2 days of school, which he was not excited about at first, but it was one of the more moving experiences of our lives and we are most grateful to have been there. While we were away from home, whether traveling or just doing regular old things, we were able to be fully present with the people and activities we were experiencing. My son and me goofing around in anticipation of the eclipse. Packing and unpacking is quick and easy. This makes preparing for trips stress-free and getting back into the swing of things a breeze. We usually don’t have vacation hangovers from the stress of vacations. Upon returning home one weekend much earlier than expected, I wanted more playtime. We got home, unpacked, started laundry, put everything away, and then had plenty of time to go to Snowbird for Oktoberfest and a hike. There was a time when I spent SO much time, energy and money organizing, and re-organizing closets, drawers and our garage. Once I no longer had as much stuff, I was able to spend time on what matters most to me. None of it is worth all of the beautiful memories I have as a result of letting go. Minimalism simply is about living with the things you truly use and that truly add value to your life. It’s a very personal experience and journey, one that I invite you to try out for yourself.